I am not a dietitian, so I am not going to recommend any form of diet. I am not an exercise or fitness expert, and yes I know what you’re thinking “you noticed that too”. Yes, I may not be in the best shape, but I recognize that I need to be healthy and for that there are ways of staying healthy. 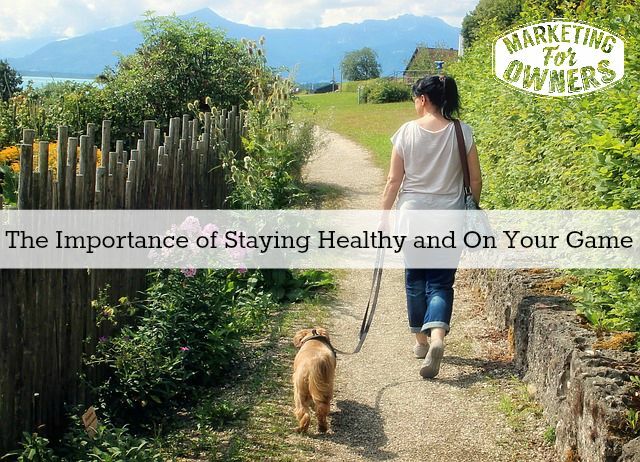 By staying healthy you can stay on top of your game. That means being productive, effective, successful and living longer, and enjoying life and things like that. Wouldn’t that be cool? How does that affect work? It’s not just work, it’s family, it’s your overall being. You shouldn’t only have goals for money and for success. You should have goals for your family life or for your personal life, you should have goals for your health and fitness, weak or no, that health and fitness is going to increase our longevity and give us a happier life. You don’t want to be worrying about being in a hospital bed, do you? Or if you’re in North America, about paying medical bills, and other countries where you have to pay medical bills. You don’t want all that, while running a business or doing a stressful job. That increases blood pressure, heart problems, head problems, everything from depression to whatever. So there are some ways to help you avoid things like that. Now, I’m going to read out some things because quite simply you are what you eat. Again, I am not a dietitian but we all know that we need to eat properly and that generally means lower fat; there are good fats and there are bad fats. But if you’re going to eat bacon sandwiches all day and if you’re going to eat fries, chips, stuffing, butter stuffing, breadcrumbs, pizza, McDonald’s fast food, Kentucky fried chicken(my favorite by the way), but if you’re going to do it too often, it is not going to work out well. Those little arteries, you only got one set, they’re all going to clog up. Also,you need to lower your sugar intake. When we’re young we throw tons of sugar in that coffee. When we go down and grab a Starbucks or we’re having mochas, or we’re having whipped cream, or we having syrup thrown in, do you have to? As you get older, taste buds tend to be different and I’m now eating and drinking stuff I wouldn’t have dreamt of eating or drinking when I was about eighteen. But consider low sugar, don’t just stop sugar, just gradually lower the dose. It is a dose, gradually lower it and over a period of six months you’ll be able to take out completely because you gradually won’t notice the difference. Oh, yes, that’s true. Lower your caffeine. There are hundreds of diets that say “a bit of coffee is great”. But most of us at work drink tons of the stuff and that includes tea; try decaf. I know, it is your thinking “You’ve got to be kidding” I drink tons of coffee and I personally cannot tell the difference between caffeinated and decaf. You may be thinking “oh, I can” but take the labels off and I bet you, you cannot if it’s the quality stuff, try it. I actually drink decaf, too but I like those fruit infusion and things like peppermint and all those kinds of things. Lower your carbohydrates like potatoes, rice, and pasta. If you just eat pasta every day, if you naturally have potatoes with everything, you’re going to be fat or fatter than you could be and that’s not good, and that’s heavy on the heart. So take that stuff out and regulate your eating. Again, I was very guilty of this when I was younger, and I didn’t bother with breakfast, sometimes until around lunchtime, especially if I was working. I would eat one meal a day. But generally we’re accustomed to eating three meals a day, but try to make them regular and smaller meals. When I say “diet”, what I mean is the real meaning of diet –it is just changing what you eat. A diet, something that’s labeled as a diet is going to be a fat, it won’t work. Just change what you eat gradually, try and work it into three meals a day and a couple of snacks in between, so it’s kind of like five meals and smaller portions. You will get used to it — just do it gradually. But look stuff up, I’m not going to recommend any. Do what you will, but just be aware of those online diet experts, who are in marketing — they’re going to make you believe what they want you to believe. So, look up a good, safe, trusted source like Dr. Oz or someone who is a good trusted source and just look for general healthy eating not for a diet. Another one is not getting enough sleep. Yes, you think “I only need five hours of sleep and I’m fine” No. You think Margaret Thatcher only had four hours of sleep a night, she had power naps in the day to get enough sleep. The reason you think you’re fine is because you’ve become accustom to it. Imagine how much healthier you would be if you had a better night sleep? Get to bed earlier, get up in a good time, try and get yourself that seven or eight hours. That’s when the body rejuvenates, you’ll be fresh up the next day. How about exercise? That is obvious. You can do anything, go for a walk, get a treadmill at home, go to the gym with a friend, you generally need an accountability partner for exercise and then you’ll do it; anything. You want to do something that brings up a slight sweat. I don’t recommend what I do. I occasionally do the insanity workout all the time but it helps, you can even do half the insanity, you can do anything just do something and again don’t “bam” nothing to “bam” all in. Do something gradually, go for a ten minute walk, listen to a podcast, listen to an Audible book on your walk, something like that, just use it as a way to relax, take it in one of your breaks. On top of that have timeouts and breaks, and by timeouts I mean long breaks. I mean you can have little ones in your work, don’t just sit down and work from morning and through lunch with no getting up unless you’re going to the bathroom. Take breaks, go out for a little walk, get some fresh air, talk to somebody, make a phone call, who knows, whatever. But also take whole days, take free days. Now, I can assure you that is one of the better ones, is taking free days where you don’t do any work whatsoever, get that? No work whatsoever. What are you thinking? You’re thinking “No way, Jose” but try it, switch off totally, leave the phone at home, switch off your internet, try it for half a day. If you want an accountability partner on that, tell your kids you are not to do any emailing, be near a computer or to use your phone for any smartphone type stuff or even a phone call that comes in. They would hold you accountable, trust me. That’s it, try that stuff, it will help, try something, anything is better than nothing, go for it, I recommend it. 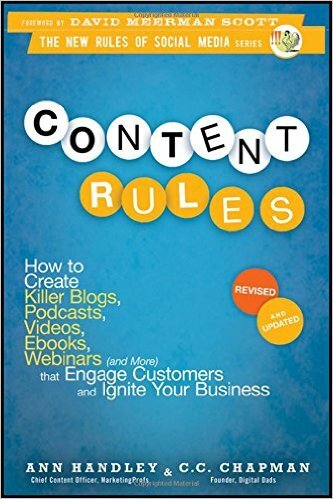 Now, it is Monday, and the book for the week today is “Content Rules” is by Anne Handley and C.C. Chapman, who’s been on before with everyone, right? The back of the cover says — “How to create killer blogs, podcasts, videos, eBooks, webinars, and more that engage customers and ignite your business”. That explains the book, and is a great read, try it, it will help. I’ll see you tomorrow.